The Junior World Championships, Ljubljana 2013 were concluded with an unforgettable team competition at the teeming Stozice Centre on Sunday. The men’s team competition featured 16 teams of five judoka while the women’s team competition featured 15 teams of five judoka. Slovenia took part in the men’s event and provided some of the best moments of the day as the crowd urged them on in their spirited pursuit of a medal. As the competition gathered pace judo fans saw Georgia emerge in the men’s event and Japan come to the fore in the women’s event. In a repeat of the 2013 World Championships in Rio, the brightest talents from Georgia and Japan matched their senior team’s gold medal-winning achievements in the third and final World Championships of the year. 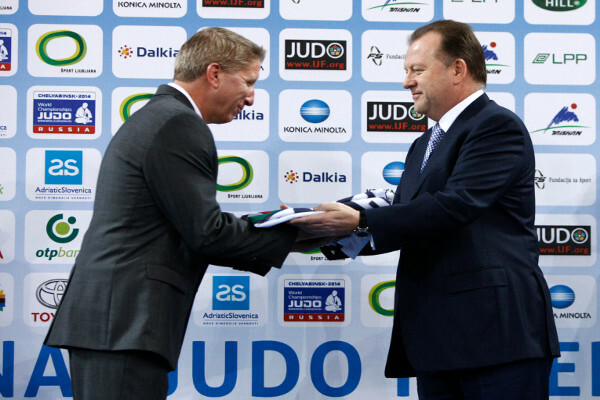 Ahead of the final block there was a passing of the flag ceremony where Mr. Bogdan GABROVEC, Slovenian Judo Federation President, returned the IJF flag to Mr. Marius VIZER, IJF President, who in turn passed it to Mr. Mike SWAIN, USA Judo representative and Olympic bronze medallist, as the 2014 Junior World Championships will be held in USA. 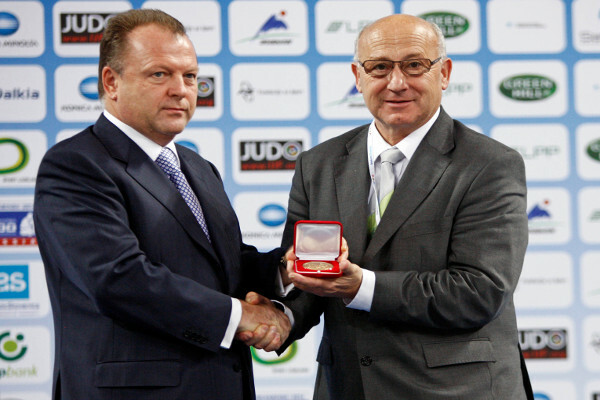 Mr. VIZER, IJF President, awarded the IJF gold medal to Mr. GABROVEC, Slovenian Judo Federation President, to commemorate the event and the organising committee's contribution to the 2013 World Judo Tour. Mr. GABROVEC awarded a Slovenian Judo Federation plaque to Mr. VIZER to conclude the awards. While the 2013 Junior World Championships in Ljubljana will be remembered for unearthing the latest starlets in the Olympic sport, many athletes will take away with them invaluable information from the ‘Judo Village’ in the venue which housed an interactive stand from the Slovenian Anti-Doping Organisation (SLOADO). The outreach programme has been co-funded by the IJF and was open for 12 hours a day during every day of the competition. 450 competing athletes took part in the interactive quiz which served to improve the knowledge of athletes on the subject and illustrate the resources that are available to them. “One athlete attempted the quiz and scored five out of 10 but he returned later in the week and scored nine out of 10,” said a SLOADO official. Greece struck first as Gela KELIKHASHVILI (GEO) lacked his usual composure and accumulated four shido penalties to gift victory to Georgios AZOIDIS (GRE) by hansoku-make. Georgia responded immediately as Phridon GIGANI (GEO) defeated individual bronze medallist Roman MOUSTOPOULOS (GRE) by a waza-ari and yuko. Greek coach Nikos ILIADIS was banished from matside for coaching during the contest rather than breaks in play. Georgia went ahead for the first time in the final as Ushangi MARGIANI (GEO) pulled through against individual gold medallist Alexios NTANATSIDIS (GRE) with a waza-ari from a uki-goshi. Despite the Georgian coach also being sent away from the floor for being overzealous his team confirmed the gold medal when individual champion Beka GVINIASHVILI (GEO) and bronze medallist Levani MATIASHVILI impressively won their contests by ippon for a 4-1 rout. The second bronze medal was won by Ukraine who steamrolled the Netherlands 4-1as the ippon judo flowed. France took the initiative as individual bronze medallist Amandine BUCHARD (FRA) fired them in front with a waza-ri from an uchi-mata in the last 30 seconds. Japan restored parity as Amelie GUIHUR (FRA) was beaten by DEGUCHI Christa (JPN) with a harai-goshi yielding ippon with one minute remaining. Silver medallist TSUGANE Megumi (JPN) gave Japan the lead after throwing Lindsay TSAN SAM MOI (FRA) with a ippon seoi-nage for ippon. Fellow silver medallist ARAI Chizuru (JPN) suffered a defeat to bronze medallist Margaux PINOT (FRA) on shido penalties with two against the Japanese and one against the Frenchwoman to level the match. Gold medallist INAMORI Nami (JPN) won the winner-take-all contest against bronze medallist Madeleine MALONGA (FRA) as she countered a ouchi-gari with a thunderous ura-nage for ippon. The first bronze medal was won by Croatia who stunned Russia 4-1. With the contest in the balance the Matic sisters provided much needed inspiration with bronze medallist Brigita winning the fifth contest by a waza-ari from a sankaku-gatame. Germany defeated Brazil by the same score to win the second set of bronze medals. Gold medallist Sappho COBAN (GER) gave them the perfect start by seeing off Jessica PEREIRA (BRA) with a koshi-jime in the repeat of the individual final. Nadja BAZYNSKI, bronze medallist Szaundra DIEDRICH and silver medallist Carolin WEISS added further wins.